"DADiSP makes this kind of analysis very easy to do, so that I only have to worry about the science, not the programming." The University of Houston is involved with the Human Genome Program in sequencing DNA. Dr. Dan Davison is involved in characterizing the human beta-globin complex. Interest in DNA and how it functions is on the rise. Examples are even found in popular literature such as Michael Crichton's fictional Jurassic Park, where recovered dinosaur DNA was used to create new dinosaurs. The Human Genome Program has made great strides in sequencing human DNA to achieve a better understanding of our own DNA. Deoxyribonucleic acid, DNA, consists of four nitrogenous bases, adenine (A), cytosine (C), guanine (G), and thymine (T). The sequence of these four bases constitutes the code which enables the DNA to control the characteristics of a cell or organism. The human genome consists of seven billion bases in 24 types of chromosomes made up of DNA. These chromosomes are organized as 23 pairs of chromosomes, with 22 somatic chromosome pairs and a pair of either two X chromosomes (in females) or one X and one Y chromosome (in males). Within individual chromosomes are areas where genetic activity takes place along with areas of inactivity. One task of the Human Genome Project is to locate and map areas of activity and inactivity. The active areas contain genes and a coding region, which typically specify which protein will be fabricated. The coding region regulates when and how certain proteins are produced. A DNA sequence contains many levels of structure and information. Adding to the complexity, the coding regions are sometimes interrupted and continued further downstream like portions of an article may be continued on different pages of a newspaper. However, unlike a newspaper, there are no instructions or markers for where the remaining portion of the coding region may be found in the DNA. Instead the cellular machinery manufacturing the protein uses subtle signals from the DNA to determine where the protein coding region will resume. 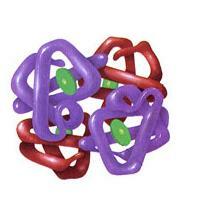 One of the genes being studied is the beta-hemoglobin complex. This complex is actually a collection of seven genes lying next to each other that are expressed at different times or stages of development. There are different versions of the complex expressed in the embryo, the fetus, and the adult, as well as other variations. 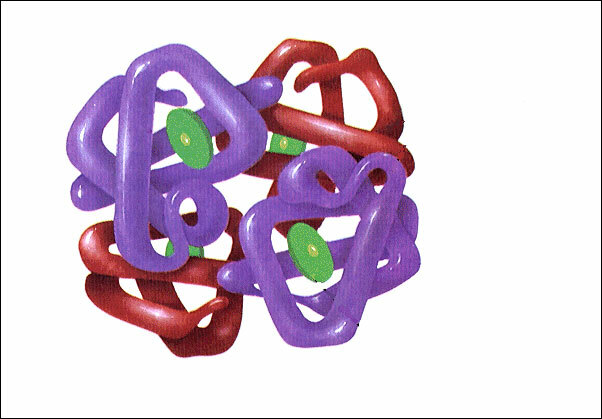 The beta-hemoglobin protein associates with the alpha-hemoglobin protein, to form hemoglobin. Hemoglobin is a protein contained in red blood cells that produces the cell's coloration, and is responsible for carrying oxygen throughout the body. Structurally DNA must curl around itself forming the famous double helix (additional curling of this double helix is called supercoiling). This results in the human genetic blueprint, consisting of billions of bases, hundreds of millimeters long, being packed into the tiny nucleus of every single cell. Detection of the levels of organization is possible because of the long range correlations between bases. Some correlations are due to protein coding, while others are due to the helical structure, superhelical structure and chromosome organization.